As a kid, I was equally interested in the arts (particularly film and dance) and science (especially space). I was in an amateur dance company, and took part in Science Olympiad and FIRST Robotics all the way through high school. When it came to deciding what I wanted to do, I was genuinely torn. My parents wanted me to pursue science, but I wasn’t that enthused. However, I was taking IB Physics, and we got to astrophysics. It suddenly occurred to me that I could study space through college, and that piqued my interest greatly. Additionally, the only person I really wanted to be in the world was Dana Scully, and she did her undergraduate in astrophysics. Once I made that connection it was an easy sell! For the How, I studied Physics with Astrophysics and Mathematics at CU Boulder, and started doing research as an undergrad in the Astronomy department. I just wanted to keep going, so I looked for graduate programs that interested me, and I went to the University of Glasgow to do a PhD in Astrophysics with the LIGO Collaboration. I like to joke that I am a one-woman career panel for astrophysics majors... I’ve done almost everything! My current life is an amalgamation of passions, but I really have a career that I am happy with and is able to scratch all those itches, from maintaining a technical focus all the way to the arts. Ultimately I love storytelling, and if I can learn something new through data and convey that to customers, or teach people science, or have a role in storytelling in the media, I’m happy. My full-time job is as an aerospace engineer through a company called GreenDart providing technical contracting, but I also do a lot of consulting for writers and creatives in the entertainment industry. 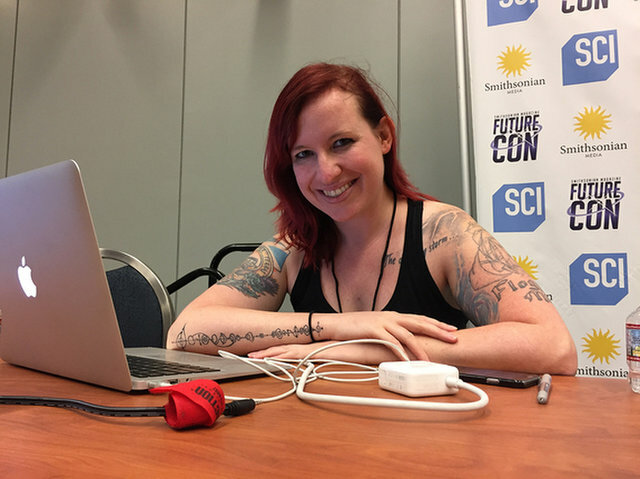 I also continue teaching the public through talks on the intersection of science with science fiction both at sci-fi conventions and more recently online. Finally, I also am involved with World Space Week as the global education resource manager. If this all sounds like a lot, it is! However, as the old saying goes, “find something you love and you’ll never work a day.” Some days are easier than others, but there’s always something I can be doing, so I usually am able to find something to fit my mood. I also make sure to not get upset with myself if I need a day off. I’m looking forward to sharing what it is like in the early stages of different careers as a scientist, trying to find what you are interested in and the highs and lows of that exploration. I plan on focusing each day on a different area/aspect, and sharing what it was like, and if I can, some of the science! My undergraduate research was in radio astronomy, and my PhD/Postdoc work was with the LIGO Scientific Collaboration searching for gravitational waves from neutron stars and GRBs (respectively). While I left before they made the first detection, I can still talk about the cool science behind it! Finally I plan on talking about what it’s like as a science educator, both in formal and informal settings. We’ll definitely throw in some science behind Warp Drives as well! I host a weekly science of sci-fi show on Twitch and YouTube called “Dr Erin Explains the Universe”. I release pre-recorded episodes (about 5-10 minutes) every Thursday, and do live Q&As and stream video games on Twitch during the week. Right now I’m doing live discussions every Tuesday on the science behind the new Star Trek series as episodes come out! I love playing video games, particularly single player RPGs, and I also am doing some work as a voice actress! I studied theatre when I was a postdoc and loved acting (it all comes back to that storytelling!). I found such freedom in voice work, and so I have been growing that as a hobby, with occasional paid work. I hope to do more in the future, but it takes time and hard work! When I reach burn-out mode (which happens!) my ideal day includes the following: sleeping in, cooking a big breakfast for myself, going for a walk in a nice pedestrian market-area, going to the library and getting a new book, going to a pub to have lunch and start said book, then coming home to play some video games or binge a favorite show (basically live in whatever fictional world I want to at the moment). If I’m feeling up to interacting with people, then meeting up with a friend or two for dinner and drinks with excellent conversation. Finally, time permitting, coming home and watching a favorite movie or episode before bed. I may have put a lot of thought into this! Please welcome Erin to Real Scientists!